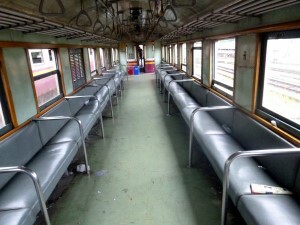 Train 251 is an "Ordinary" service on Thailand's Southern railway line, that departs from Bang Sue Junction station in Bangkok, to Prachuap Khiri Khan town, on the Gulf of Thailand. This service comprises of just 3rd class seat coaches which are fan cooled and as you can see from the schedule above, this train stops nearly everywhere along its route. When you board the train you may find two types of carriages. 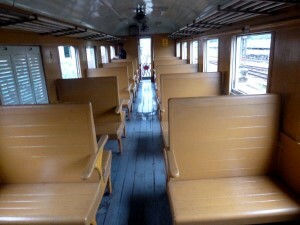 The wooden seat or padded side seats carriages. Personally I prefer the wooden seats, as you can sit and watch the world go by with a nice wind to keep you cool, rather than having you back to the window in the padded carriages. Tickets on these Ordinary trains are very cheap for tourists (free for Thai people) and if you wanted to do the total journey on train 251's route, it would cost you just 56 Baht to travel the 301 kilometres from Bangkok to Prachuap Khiri Khan. Much cheaper than the bus fare along this route, it is a really cheap way to travel and very handy for shorter trips to less well known destinations on the Gulf of Thailand. However, these services do tend to spend a lot of time waiting at stations for the faster and more expensive Rapid and Express trains to pass, so be prepared for delays!